A more dovish pivot from the Fed has helped extend a fixed income rally that began in the latter part of 2018 much to the chagrin/disappointment of fixed income investors with maturing bonds and cash to invest as they navigate a lower rate environment. Within the tax-exempt markets, investors are feeling these impacts of Fed policies even more so. Municipal bond valuations have an additional tailwind when factoring in increased demand and constrained supply, both resulting from tax reform legislation. One option for tactical investors could be the taxable municipal bond market, which, when factoring in state tax-exemption from taxable munis, offers a yield benefit over other fixed income equivalents. Over the past 24 months, municipal bonds have been some of the best performing subsectors of the fixed income market. 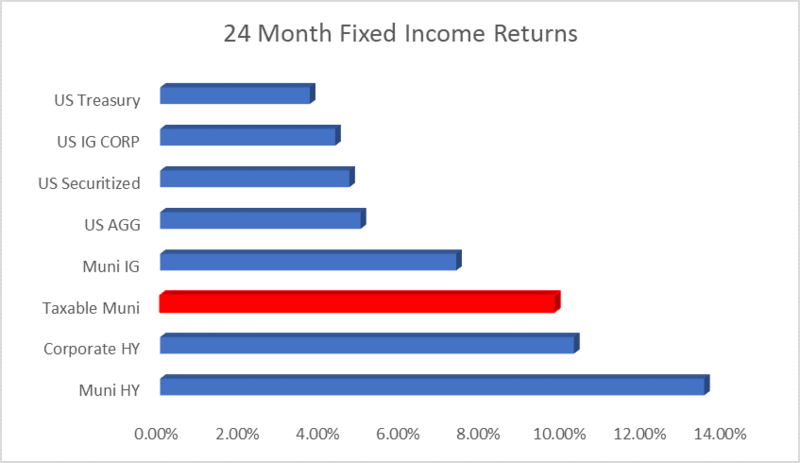 High yield municipal bonds have led fixed income returns, followed closely by both taxable and tax-exempt munis. Relative to the tax-exempt market, the taxable muni market has far fewer issuers and tends to sell bonds in larger issuance tranches. This enhances the market’s attractiveness to both retail and institutional buyers because it is more liquid and less fractured. The taxable muni market has also benefited from global attention from foreign investors seeking out holdings in a lower default market, while capturing higher yields than global sovereigns offer. As the U.S. economy heads into the later stages of the economic cycle, taxable municipal bonds also serve as an alternative investment that is uncorrelated to the risks in the corporate bond markets. Taxable municipal bonds are immune to corporate behaviors such as mergers and share buybacks, which can adversely impact corporate credit. Traditionally, we have viewed the role of taxable municipal bonds as an alternative to corporate bonds within taxable portfolios. However, we believe that taxable munis can also benefit tax-exempt investors, especially in coastal states such as California and New York. This is due in part to: 1) the precipitous decline in tax-exempt muni rates and 2) the fact that taxable munis carry an exemption from state income taxes. The case for taxable municipal bonds becomes stronger when looking at the after-tax yield benefit compared to recent California bond sales for a local school district and community college district. The above example looks at AAA-rated West Valley Mission CCD, which sold bonds maturing in 2023 at a yield of 1.33% on March 25th. By comparison, the taxable California GO bond offers almost 37 basis points of additional after-tax yield. Another recent comparison is Aa3-rated East Side Union High School District, which priced 2023 bonds at a yield of 1.50% on April 9th, giving the taxable municipal GO 20 basis points of additional yield. Further support for the purchase of taxable munis compared to tax-exempts can be found when looking at ratios. For municipal buyers, much focus is given to following the ratio of AAA tax-exempt munis to the corresponding tenor of U.S. Treasuries. A ratio of munis/UST above 100% sends a strong buy signal that munis are becoming cheap relative to their taxable alternatives. The tax-exempt munis to taxable ratio remains well below 100% despite the ratio rising since the start of the year points to the value in taxable municipal bonds. Considering the benefits taxable munis have to offer, we believe this vehicle may be a unique fixed income opportunity for certain investors. The views expressed are those of the author(s) and do not necessarily reflect the views of Clark Capital Management Group. The opinions referenced are as of the date of publication and may not necessarily come to pass. Forward looking statements cannot be guaranteed. Material presented has been derived from sources considered to be reliable, but the accuracy and completeness cannot be guaranteed. This is not a recommendation to buy or sell a particular security. This information is for educational purposes only and should not be considered financial advice. Clark Capital reserves the right to modify its current investment strategies and techniques based on changing market dynamics and client needs, and there is no assurance that their assessment of investments will be accurate. The information discussed herein is not a recommendation to buy or sell a particular security or to invest in any particular sector. Clark Capital Management Group, Inc. is an investment adviser registered with the U.S. Securities and Exchange Commission. Registration does not imply a certain level of skill or training. More information about Clark Capital’s investment advisory services can be found in its Form ADV Part 2, which is available upon request.